The price of crude oil in the futures markets has oscillated wildly during the past five years. Although these price swings may partly be a result of insufficient supply meeting large demand for oil, economic data demonstrate that market fundamentals have in fact remained in equilibrium. An overwhelming number of market participants, financial analysts, and academics have instead shown that unregulated excessive speculation in the oil futures markets is to blame. Such excessive speculation is a result of the financialization of commodities, which has exacerbated price swings in oil because the speculative upward betting causes artificially high prices that do not reflect actual demand. 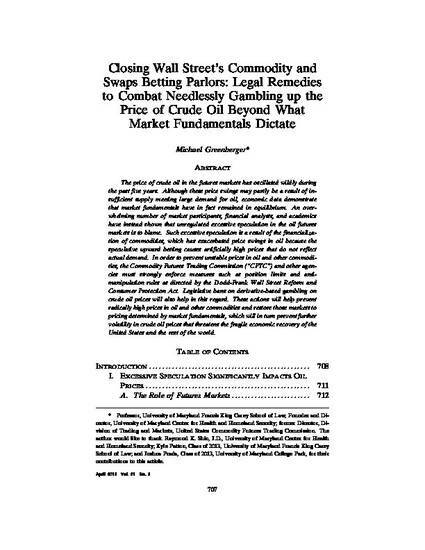 In order to prevent unstable prices in oil and other commodities, the Commodity Futures Trading Commission (“CFTC”) and other agencies must strongly enforce measures such as position limits and antimanipulation rules as directed by the Dodd-Frank Wall Street Reform and Consumer Protection Act. Legislative bans on derivative-based gambling on crude oil prices will also help in this regard. These actions will help prevent radically high prices in oil and other commodities and restore those markets to pricing determined by market fundamentals, which will in turn prevent further volatility in crude oil prices that threatens the fragile economic recovery of the United States and the rest of the world. 81 George Washington Law Review 707 (2013).